"arm" shows the arm that holds the camera that monitors the guide star. Another method is multi-object spectroscopy (MOS) via slit-masks. 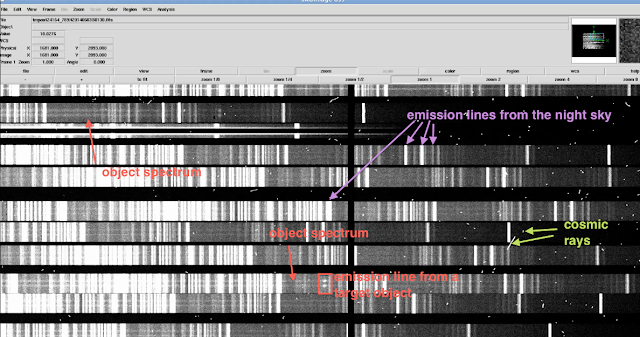 With this method you can take spectra for many objects at the same time by placing slits on many objects and blocking out the rest of the sky. This requires the creation of so-called MOS-masks in which the slit areas and the blocked out areas are clearly defined. This means that for every different observation you need a custom mask. Most current instruments require these masks to be prepared well in advance of the observation and to be cut out of plastic. This process isn't feasible for a space telescope, but works very well on the ground. However, times are changing. 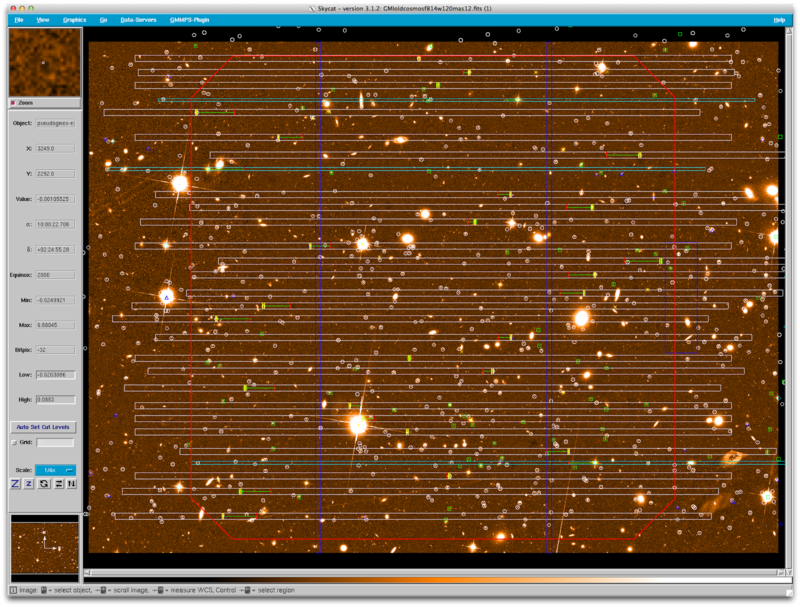 For example, for the MOSFIRE (Multi-Object Spectrometer for InfraRed Exploration) instrument at the Keck Telescope, the masks are created on the fly and "bars" that create slits are then moved into the right position within the instrument. Also for the upcoming James Webb Space Telescope a MOS unit will be available. It is designed in such a way that little shutters open and close to produce slits and masked out areas. For many other instruments however, a mask is essentially one large piece of plastic that has lots of tiny slits cut out of it. The slits are placed exactly where you want to observe an object. To create such a mask is in principle relatively simple and I illustrate the process here with a series of images. 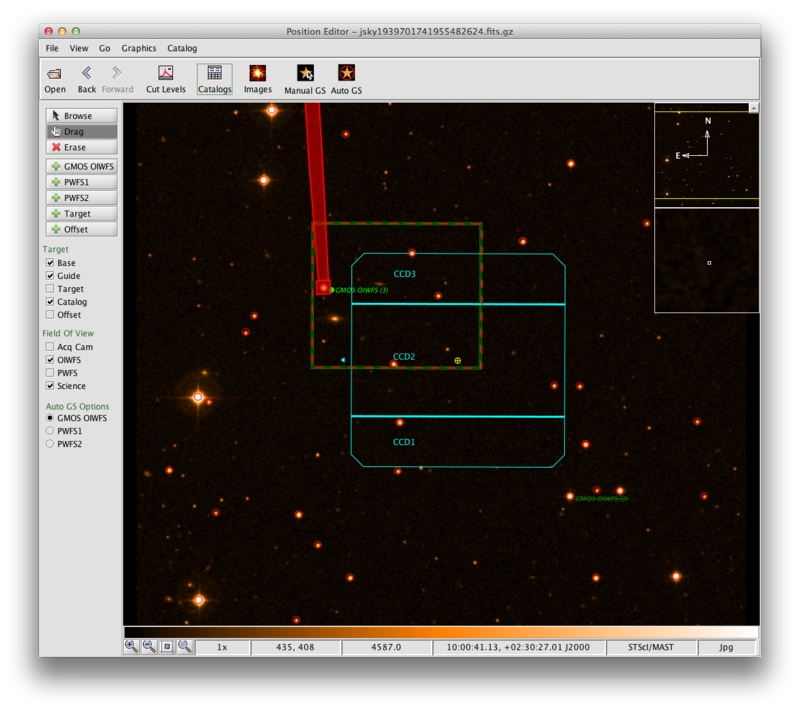 I recently created some MOS masks for the Gemini Multi Object Spectrograph (GMOS) instrument at the Gemini Telescope to observe CANDELS galaxies and will use one of the masks I created as an example here to illustrate the process. 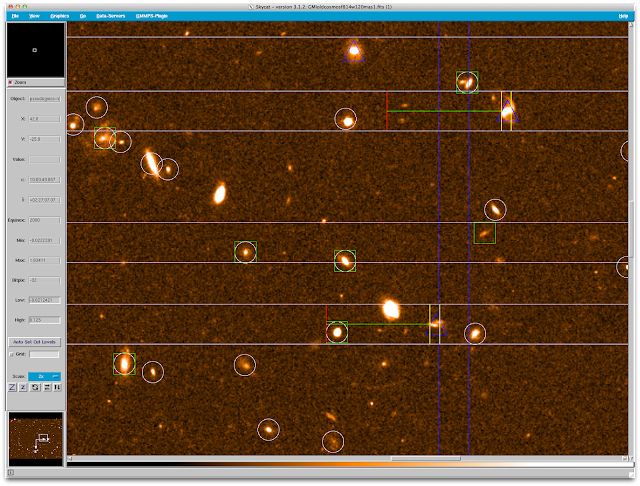 Firstly, an image of the desired piece of sky in which the positions of the objects you want to observe are measured (Figure 2) and a list of objects, i.e. a catalogue, are required. From that list we picked our desired targets. Often these are selected based on specific properties and limited by their brightness to ensure the maximum success with the granted observation time. 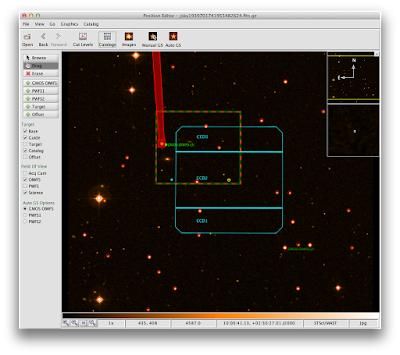 Then we also need a list of stars to guide the telescope and to align the mask properly. Guide stars are used to correct for the rotation of the Earth throughout the observation so that the telescope is pointing at the same portion of the sky the entire time. You can see an example pointing in the first figure. Figure 3: Zoom in to show the placement of slits on some targets. Objects with blue triangles have highest priority, next are objects with green boxes, and then those with white circles. The yellow vertical stripes overlaid on an object show where the slit will be placed and cut out of the mask. The horizontal white lines mark the extension of the dispersed light, i.e. the spectrum of the object. Basically, all the light that hits the disperser when it comes through the vertically extended slit, is dispersed in the horizontal direction. Alignment stars are included on the mask to make sure all the slits are on the selected objects and not on some other piece of empty sky when the telescope operators define the pointing of the telescope. Then we take this image and list of targets and run them through the provided software for the given instrument. Usually, the original list of targets leaves room for other objects to be placed on the mask as well, so we basically work with a prioritized list of objects. 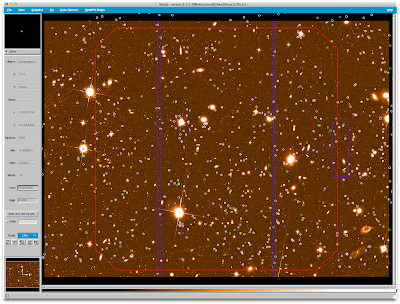 The highest priority objects are "forced" onto the mask into the space left after placements of the alignment stars to observe as many as possible of the desired targets. Then any available gaps are filled with objects of lower priority. In Figures 3 and 4 you can see all the slits that were placed on this particular mask and a zoom in that shows you a slit. After this, the observer can manually remove objects that received a slit if he/she wants the software to pick out a different object for example, one that might be more optimally placed. Then there are usually a few iterations in which the slit placement is refined a bit more and the maximum amount of objects are placed on the mask. And that's it, the mask is finished. All that is left to do is create all the masks for all the pointings in the same manner and then sending them off to the telescope and instrument support team for checking and approval. Once a mask is approved, all the necessary information is send to the mask cutting team who cut the mask, meaning all the tiny slits are cut out. After masks are cut, they will be installed in the instrument and then it's anxious waiting for us for the completion of your observations if they are carried out by the support astronomers at the observatory (Figure 5) or hoping for good weather if we go to the telescope ourselves to carry out the observations.